Clary and the others go to the City of Glass to find a way to wake Clary’s mother up, and also to kind of stop Valentine from taking over the world. Clary wants to go to Alicante to find a warlock who apparently knows how to wake her mom up. However, Jace and Simon want to keep her safe and keep her from using the portal the Lightwoods are using to do to the City of Glass. But when the Lightwoods use the portal, they are attacted by the Forsaken and Jace is forced to bring Simon along, because he’d be dead otherwise. Clary arrives at the Institute fo find that the portal is now closed, but against Magnus’s orders, she creates a new one (because she’s got the crazy rune gift) and drags Luke along with her, into Alicante. They land in Lake Lyn, the lake where the angel Raziel appeared with the Mortal Cup and Sword to Jonathan Shadowhunter. But the thing is, the lake is kind of poisonous for humans. So they do their best to hurry into Alicante as fast as they can. When they finally arrive in the city and sneak in unnoticed, they go to Amatis’ house. Amatis heals her, and Clary learns that she is Luke’s sister and was the first wife of Stephen Herondale (the Inquisitor’s son). Valentine made Stephen (one of his followers) divorce his wife after Luke became a werewolf. Clary sneaks out of the house to find the Lightwoods, and is introduced to Aline Penhallow and her cousin Sebastian Verlac. She finds Jace and Aline kissing and fights with Jace over it. Heartbroken, she returns to Amatis’ house. Meanwhile, Simon is called to the Clave and ends up in prison. Turns out that these Shadowhunters are a bit suspicious of Daylighters. On her way to search for Ragnor Fell (the warlock), Clary runs into Sebastian who decides to go with her. They go to Fell’s home to find Magnus Bane instead. Clary finds out that Fell has been killed, and Magnus tells her to search for a spellbook in the Wayland country home. When they go to the ruins of the house, Sebastian and Clary kiss. Sebastian has some anger management issues. Jace arrives at Amatis house to apologize to Clary, and they go to the Wayland house together. When they find the spellbook, they also find a half-dead angel in the basement. They learn Jace has demon blood, kill the angel and when the house starts to fall apart, barely make it out alive. And then they share a passionate kiss (wooo). When they arrive back in Alicante, the city is in flames. Isabelle saves Aline from being taken by a demon, Alec and Magnus kiss (another wooo) and Clary gives the spellbook to Magnus. Clary, Jace and Alec go to break Simon and his prison friend Samuel out of jail. 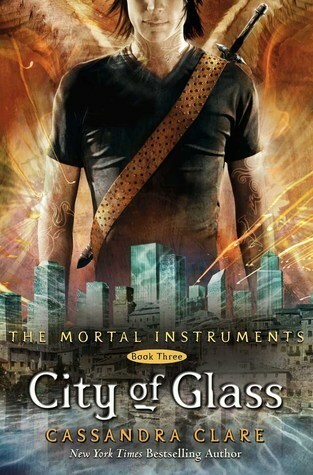 Only… Samuel turns out to be Hodge, who tells them the last of the Mortal Instruments (the mirror) is actually Lake Lyn. Hodge is then killed by Sebastian and they finally realize the dude is evil (and also a spy for Valentine. When they go to the Hall where all the other Shadowhunters are, they find out Max (the third Lightwood kid) has been killed. After Max’s funeral, Jace sneaks into Clary’s room and they fall asleep together. But Jace sneaks out again, leaving a goodbye note. Clary convinces the Clave to fight Valentine alongside the Downworlders, creating a rune the dying angel showed her, that binds a Shadowhunter to a Downworlder and makes them more powerful. When Jocelyn arrives (woken up by Magnus) she tells Clary that she has Angel blood, just like Jace, who is actually Stephen Herondale’s son. Sebastian is actually Jonathan, Valentine and Jocelyn’s son. While the battle between the Shadowhunters, Downworlders and demons goes on, Clary portals to Lake Lyn to stop Valentine. He wants to sacrifice her (lovely father), but sacrifices Jace when he arrives instead. But Raziel sees through Valentine’s evil plan and kills him. He grants Clary one wish, and she wishes for Jace to be alive. There is a big party to celebrate the defeat of Valentine and his demons, and Clary and Jace meet up. They kiss and can finally be together and everything is right again. Afterwards, they join the others to watch the fireworks. Shadowhunters: Men/Women that drank from the Mortal Cup consisting of Jonathan Shadowhunter and angel Raziel’s blood. Their children are Shadowhunters as well. Their job is to keep the downworlders in line. Downworlders: A term referring to creatures that are not human, such as faeries, warlocks, werewolves, vampires, demons, etc. Clave: These are the big wigs of the Shadowhunters. They make all the major decisions. Rune: Marks drawn on the skin of Shadowhunters to give them specific powers or protection. Iratze: A rune that heals Shadowhunters super fast. Stele: A tool that Shadowhunters use to create runes on the body. Witchlight rune-stone: basically a rock that gives off light. The Uprising: A group of Shadowhunters back in the day formed a group called ‘The Circle’. They tried to take the Clave down.